The Citizen’s Hotel opened in 2008. The building was once the former headquarters of California Western State Life Insurance. Built in the 1920’s the building was one of Sacramento’s first skyscrapers. The Citizens hotel has become very popular for those who want something different from the cookie cutter hotels in the area as no two rooms are alike. The hotel is located at 10th and J Street downtown across the street from Cesar Chavez Park . The park is well known in the area as a place for concerts. farmers markets, wine tasting and other events. If your a guest of the hotel and want to sit down outside, its fine as long as its before 11pm. A first time visitor to Sacramento from Houston said he having a cigarette after a late meeting and was told by a police officer the park was closed and he would have leave. Some cities close their parks in the evenings mitigate the homeless population. With the exception of K street, there are few places, where one can sit down. The new Sawyer hotel next to Golden One Center opens in a few months. The plaza between the new hotel/condo isn’t visitor friendly once the events has ended at the arena. The nearest park is Cesar Chavez. The gentleman from Houston will share his experience at the park with others. Perhaps to professionals in the Travel Industry. New York, Miami ,New Orleans, Memphis and Honolulu and others cities with large homeless populations have programs in place to keep their public parks and open areas near hotels and attractions safe for tourists. Sacramento wants to be an destination. Attracting conventions and National sports events. To accomplish that, the city will need to become visitor friendly. Oakland Didn’t Have a Chance Keeping the Raiders and that’s a good thing! In 1960, the Oakland Raiders was founded. They played their first games at Kezar Stadium in San Francisco, they shared the field with the San Francisco 49ers. In the late seventies, many Stadiums at taxpayers expense began adding luxury boxes to their venues. National Football league,teams must share a portion of their ticket revenue the funds help teams in the smaller markets. Luxury boxes are exempt from this agreement and is very profitable. Oakland wanted to be apart of this movement, however taxpayer expense. In addition to the luxury boxes, the team wanted additional seats. See Ya Oakland, Los Angeles is the place to B! In 1982, the Raider moved into the Los Angeles Memorial Coliseum. Opened in 1923 the stadium was much older and larger than the Oakland Coliseum. For a game to be shown in the local market requires the stadium to be sold. The Memorial Coliseum with a capacity of nearly ninety thousand meant many of the games weren’t televised in Los Angeles, the nation’s second largest market. The Raiders wanted a new venue in Los Angeles. In 1995, Raiders majority owner Al Davis agreed to build a new stadium at Hollywood Park in Inglewood. The agreement was sealed with an handshake between the Chairman of Hollywood Park and Davis. As the agreement was being finalized, Davis shocked the Chairman and the City of Inglewood by asking for 10 million dollars. City officials initially thought Davis was joking, after all he was able to get 10 million dollars from the small city of Irwindale back in 87 and Sacramento was prepared to give him 50 million in 1990. Everyone was laughing in Inglewood at the council meeting except Al Davis. Los Angeles, has been indifferent to football. For many in LA, there are two teams. The LA Dodgers and the Lakers. Public money wasn’t forthcoming so Davis looked north. By 1995, Oakland gave Al Davis everything he wanted. Luxury boxes, 10,000 additional seats and built the team a training facility and paid for the teams moving cost. The cost to the citizens of the City of Oakland and Alameda County was over 220 million dollars in addition to the current loan. A personal seat license, or PSL, is a paid license that entitles the holder to the right to buy season tickets for a certain seat in a stadium. This holder can sell the seat license to someone else if they no longer wish to purchase season tickets. However, if the seat license holder chooses not to sell the seat licenses and does not renew the season tickets, the holder forfeits the license back to the team. Most seat licenses are valid for as long as the team plays in the current venue. (1)In Oakland, the cost for the PSL ranged from $250 to $4000. The first year was a disaster, the cost of tickets and parking was much higher than before. Many of the early games weren’t blacked out because the Raiders were unable to sell out in the enlarged stadium . The PSL strategy was a dismal failure. Adding insult to injury ,the Raiders received a substantial discount on the deal they paid the county. The top section of the expanded stadium known as Mount Davis was later covered in tarp, and not used. Raiders majority owner Al Davis, died in 2011 and his son Mark Davis took the helm. With the lease expiring in 2013, the Raiders wanted a new state of the art stadium in Oakland, funded largely with public dollars. The cost of building football stadiums have skyrocketed. In 1975, 79,000 seat Louisana Superdome opened at a cost of $150 million dollars (nearly 600 million dollars in 2017). The 80,000 AT&T Stadium in Texas, home to the Dallas Cowboys cost 1.3 billion dollars. With Football Stadiums costing a billion dollars, the NFL has encouraged teams in the same market to share a facility. The New York Giants and the New York Jets share the Met Life Stadium in East Rutherford, New Jersey. The 1.2 billion dollar Levi Stadium, home of the San Francisco 49ers was built with two NFL teams in mind. The stadium has an extra set of locker rooms. Mark Davis, was never open to the idea. He didn’t like the location in Santa Clara, 30 miles west of the Coliseum. Didn’t liked the layout. Davis shopped the team to San Antonio, San Diego and Las Vegas. Las Vegas a metro area of 2.3 million, long wanted professional sports. The area has been a form of kryptonite to professional sports due to gambling. Last year, the National Hockey League announced Las Vegas won the expansion franchise and the Vegas Knights Golden Knights owned by Bill Foley and the Maloof Family (former owners of the Sacramento Kings) will play their first season this fall at the New T-Moblie Arena. Sheldon Adelson Billionaire and CEO of the Las Vegas Sands Corporation was the reported architect in bringing the Raiders to Las Vegas. Adelson who’s wealth is estimated at 32 billion dollars agreed to invest 650 million towards the Stadium. The Raiders would in invest 500 million and $950 million dollars in public money the largest taxpayer subsidized stadium deal in history. Adelson reportedly persuaded Goldman Sachs to finance the stadium. With the exception of approval from NFL owners, every thing was in place for the Las Vegas Raiders. The new stadium would be shared by the University of Nevada, Las Vegas football team and would host other events in the city. Adelson, with holdings worldwide learned the Raiders were negotiating without him. In the lease the Raiders would pay one dollar a year and annual rent. The could restrict scheduling for UNLV footballs games. Other proposals and revenue streams benefiting the Raiders caused Adelson to pull out. Football is a business, Mark Davis, made a tidy profit, a billion dollars, Oakland didn’t have a chance. The Citizens of Las Vegas are on the hook for $950 dollars. The money will come from the hotel tax, any shortfalls will come directly from taxpayers. 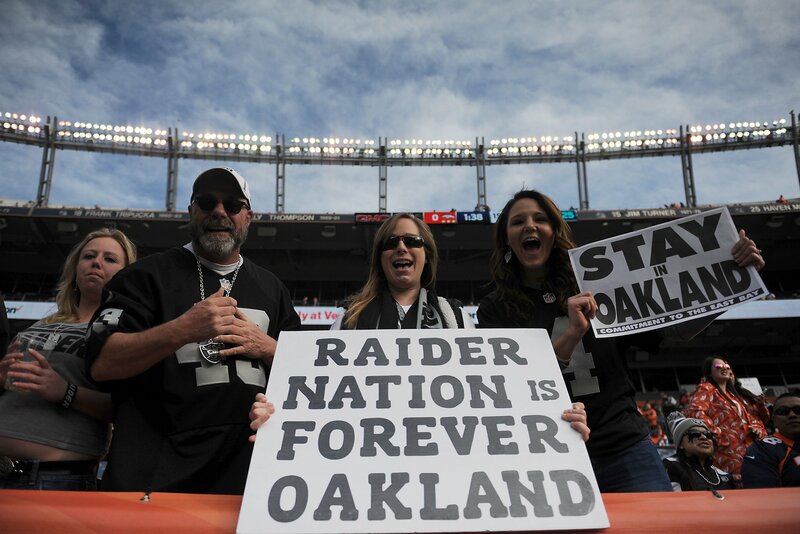 The Raiders will play in Oakland until the new stadium is completed in 2020. Fans are not likely to make the five hundred and fifty mile drive on Sundays to Las Vegas. The Vegas Market is considerably smaller(40th) and less affluent than Oakland’s (6th) The question becomes will Las Vegas Tourist help fill the stadium, will the Vegas fans support the team as Oakland did? Mark Davis, has little to concern himself with for now. He has a billion dollars, its not likely that he would received that amount of public money from any medium or large city. Few cities are willing to take the risk Las Vegas has. Worst stadium business deal in the world ? The Business Insider (4/2/17) says Las Vegas made the worst stadium business deal in the world . Clark County taxpayers will contribute $750 million to the new arena, a record for a sports facility—about $354 per resident, taken from an increased tax on hotel rooms. That tax currently pays for schools and transportation, in addition to tourism-related expenditures. Half the room tax goes to support state schools and county transportation. So if the new tax on hotel rooms directed to the stadium does drive room prices down, the money comes out of schools and buses. In fiscal year 2015, a quarter of the tax paid for Nevada education, another 14 percent for the Clark County School District, and 9 percent for Clark County Transportation. Oakland is unique, no other city in recent memory has lost the same professional team twice. I am a life long Raiders fan, the team in my blood. I went to my first game in the seventies. My older brother worked for General Motors and would give me game tickets and I would often go alone to games. Like many Raider fans, I am passionate about the team, win or lose. When they moved to Los Angeles, my heart was broken. Today I have a greater understanding of the business of sports. Fan loyalty ranks a distance second to the all mighty dollar. Many cities enter into fragile financing schemes that leave the local budget vulnerable to shortfalls. Forcing many cities, to make cuts in police, fire ,schools and other services to make up for the shortfall. Taxpayers obligated to pay for these buildings, after the teams leave. One City, St Louis, Missouri is fighting back, they are suing the NLF, they believe the NFL defrauded the city. 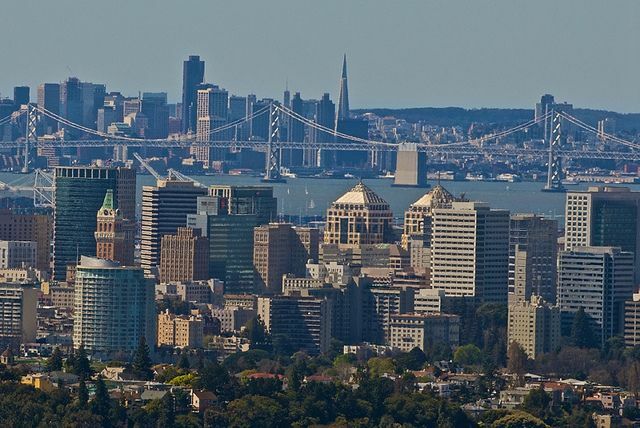 All over america there are heartbroken fans after teams leave they’re city for greener pastures.The Citizens of Oakland should be proud of Mayor Libby Schaaf and other area leaders as they could have paid the ransom the Raiders wanted (for now) and mortgaged the future of the city. At the end of the day, Oakland couldn’t compete with Las Vegas’s offer. Few Cities could. Some cities like Seattle and the Milwaukee area have closed the loophole that allow leaders to mortgage the city without public approval. Unfortunately, Oakland isn’t done. The Golden State Warriors Basketball Team are returning to San Francisco in a few years and the Oakland A’s Baseball Team wants a new home and there are other cities like Las Vegas, ready and willing to mortgage the farm. 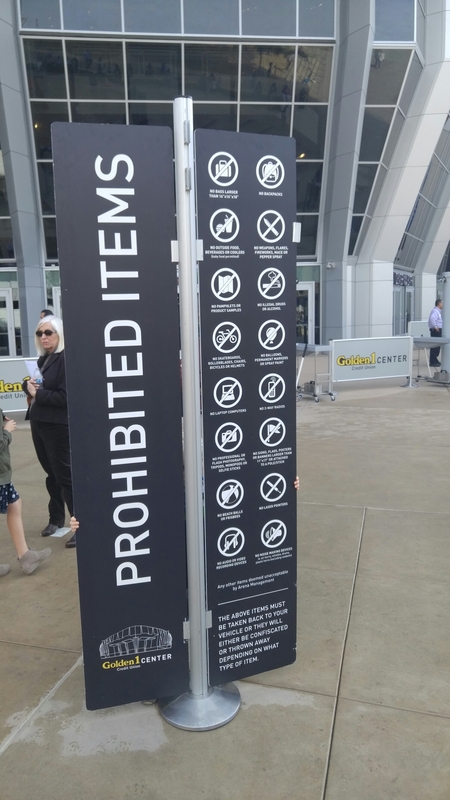 After being ninty minutes late with some concert fans paying more than $300 to hear Kanye at Golden 1 Center got a less than what they paid for. What they got was two songs and 17 minutes of his thoughts and opinions. We could you tell you what he said, but………. TWITTER, WENT WILD, SO DOES HIS FANS! West Natomas: Angeline Jolie is not, has never planned to move to Sacramento. A rumor started by a party of one suggested Ms Jolie was relocating her small active family of ninty billion children to the realtively quiet confines of Sacramento. Here in Sacratomatoville, the media (with the exception of CW31) would leave her completely alone. Sacramento might have a calming effect on Ms Jolie-Pitt. Unlike Hollywood, she and her family could shop at Dollar Tree in relative anonmity, filling their carts with powerade cleaning products and All Star Soda . Stars in Sacramento? My computer says yes! Sir Paul McCartney should be in town preparing for his two perforances as he opens (in all caps) THE GOLDEN 1 CENTER in downtown Sacratomatoville tomorrow. A few years ago, the city went all Lady Gaga after Prince was sighted in various resturants in town. My computer says its unlikely Sir Paul will turn the city on its ear. As most millennials wont recognize him without looking him up on their smartphones. Sir Paul’s fan base can be found at the Orange Julius at the Sunrise Mall,a notorious baby boomer hang out. Whole Foods is out at Residential /Commerical project at 20th and L in midtown. What the area doens’t need is another Safeway or Raley’s. Councilman Steve Hansen, suggested Nugget Market . I think Nugget would be a better fit for the area than Whole Foods. So next month draw a line through the names of Hillary Clinton and Donald Trump and write in Nugget Market. Final touches are being added to the New Golden 1 Center at 5th and J Streets in Downtown Sacramento. After more than a decade of ultimatums and threats ,the new home of the Sacramento Kings will open October 4th with a Paul McCartney Concert. The half billion dollar venue can accommodate 17,500 for basketball and 19,200 for concerts. The arena was constructed in an existing shopping center and located across from Macy’s. This fall, a 10 screen movie theater will open in the center in addition to new shops and restaurants. No parking structures were built for the new arena. 180 acre Sleep Train Arena ,the former home of the Sacramento Kings offered thousands of parking spaces. Access to Sleep Train was easy due to a loop road and proximity to I-5 and I-80. Access to the new arena will be challenging .Most people access Downtown ,via J Street and exit via I Street. There will be severe delays on I-5 during events. The city currently owns 5000 parking spaces near the arena. When there are events at the arena, it will impact everything west of 10th street. Parking in Old Sacramento, Amtrak, Crocker Art Gallery, and the shopping center itself which lost hundreds of parking spaces to accommodate the arena. The difficulty of parking may have a negative impact on business when there are events at the arena.The city is asking for those attending events at Golden 1 to reserve parking spaces in advance. Next month the city will be launching an app to use with a mobile device, and each time you use it you’ll receive a 25 percent discount. Meaning, the $15 reserved spots at public lots now will only cost you $11.25. There are several office buildings near the arena with parking garages that are usually empty at night and weekends, the question, is how many of those will open for events at Golden 1? Regional Transit will be overwhelmed due to the absence of staging areas. It is also unclear if the cash strapped system will extend its operating hours to accommodate riders. Amtrak has extended hours along the Capitol Corridor, the station is two blocks from the Arena. City leaders have high hopes for the center. Saturday night May 1. I’m in downtown San Jose on Santa Clara Street looking for an freeway on ramp. As I neared the freeway, the traffic stopped, impatient drivers began making u-turns as we inched forward, I thought to myself, there must be a traffic accident ahead, its was 10:42pm. I have heard about grid lock, but never experienced it…… For some strange reason, cars in the right lane was inching forward. Changing lanes was futile, there where cars in the middle of Santa Clara unable to move, and drivers in the right lane unwilling to allow other vehicles in. As the cars inched forward, I saw flashing lights, it was the San Jose Police, directing traffic away from HP Pavilion. Allowing taxis and limos to turn on to a small street but forcing other cars to turn around, after 5 or so minutes it was gridlock on Santa Clara. Suddenly there were thousands of people on both sides of Santa Clara, walking to the surrounding parking lots… Many walking between cars. Unable to move, I turned my engine and lights out and watched smiling Eagles concert fans walk pass me. It was now 11.25pm. The clouds grew smaller and the officer started picking up the orange cones in the street. We continued to sit,waiting for instructions, as he loaded the cones on to the hood of his car, the car to my immediate right, pulled forward and drove around the police cruiser. the officer oblivious to the waiting cars, focused his attention to the cones. When I pulled in front of the arena(one block away) it was 11.46pm.